The Sanyo VPC-WH1 is a waterproof “Dual Camera” that stood out at the product unveiling today. In fact, in some ways its their higher grade one (Sanyo has one other waterproof cam.) Although we didn’t get to dunk it in a pool of water the capabilities featured in the presentation seemed appropriate for consumers and enthusiasts alike. First off, this VPC-WH1 shoots 1280×720 HD video at 30fps. That means all your underwater video is going to look very good (compared to what’s out there at this level) on both Vimeo and YouTube–providing you have great lighting to accompany you. The VPC-WH1 does not have a video light of any sort, so that means that some of your images may turn out a bit noisy. In this case, Sanyo’s 3D DNR image noise reduction technology won’t be able to help you because the image becomes softer: meaning that whatever you shoot underwater in theory will look even softer than it already might. Additionally, the 2.5-inch LCD (not very high resolution) might not be able to help you out very well. Once again though, we haven’t tried it yet, but I’d recommend finding good lighting. However, image quality actually looks quite good for this camcorder. The 30x Optical Zoom works very well and its focusing is satisfactory. It can shoot 2MP photos which is good enough for posting online. Additionally, it captures JPEGs at 13fps. In contrast though, many cameraphones shoot higher resolution photos than this–although their sensors aren’t as large. Nonetheless, you may not want to make 8×10 prints of the shots. What amazed me was the battery life: a whopping 3hrs and 20 minutes. The new Sanyo Li-ion batteries are what makes this possible. That may mean less charging when you and the family are on vacation. Additionally, the Dual-Camera is very ergonomic and felt great in my hands. It’s very small, and I’m sure that it could fit into a coat pocket. The “Face Chaser” technology worked well and focused very sharply on the people around me while I was trying it out. Once again though, I would’ve loved to have tried this underwater with people wearing snorkels and facemasks to give it a real test. 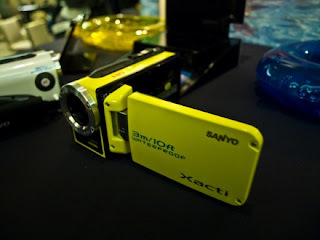 Sanyo chose the interesting color of yellow for this camcorder. Perhaps this is so if users drop the camcorder in water it can be found because of its bright color. However, it comes in blue as well, so my theory may not be accurate. Unlike other cameras and camcorders of this type, Sanyo warns of use in cold locations or in areas with high temperatures/humidity. However, they also say that it can be used for winter sports like skiing or snowboarding. Potential users may want to keep in mind that there is no 60p video recording on this model; so the 30fps will have to suffice for getting those fast moving objects. Additionally, this camera can be used without fear in the rain. Overall, it seems like the WH1 Dual-Camera will answer the pleas of many consumers. In fact, I think it will accompany a traveler or tourist very well so long as they are shooting with enough light.